Bello also called on Obasanjo to reveal to Nigerians the presidential candidate of the ADC. The Governor of Kogi state, Yahaya Bello has taken a swipe at former President of Nigeria, Olusegun Obasanjo. Bello said this in reaction to reports that OBJ and his group, Coalition for Nigeria Movement (CNM) has adopted the African Democratic Congress (ADC) as it’s political platform. Governor Bello also bragged saying that other states in Nigeria has so much to learn about politics fromKogi state. 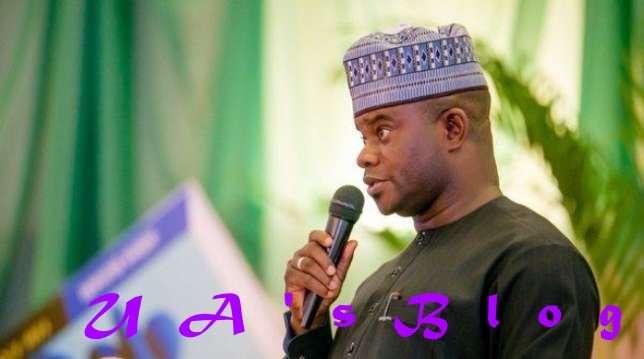 Governor Yahaya Bello of Kogi state came under heavy backlash recently on the floor of the Senate. Senator Ahmed Ogembe alleged that thugs loyal to the Governor disrupted an empowerment programme he was holding in his constituency, Kogi Central. In his reaction, Abia lawmaker, Enyinnaya Abaribe said that "Yahaya Bello behaves like a little Hitler"
The deputy Senate leader, Bala Na’Allah also described Governor Bello as a threat to Nigeria’s democracy. Senator Dino Melaye also accused the Kogi state Governor of planning to poison him using men of the Special Anti-Robbery Squad (SARS). Governor Yahaya Bello has severally declared his loyalty for President Buhari. Bello has also announced that he can die for the President.